Some things are "first importance" things. They lie at the heart of the matter and are central to the issue at hand. For us as Christians, we don't have to doubt what those "first importance" things are. 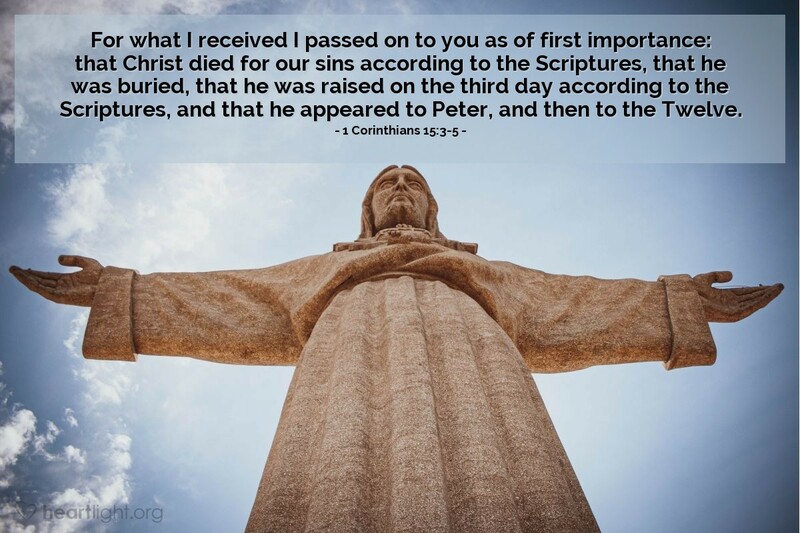 The Gospel of our salvation is built on one simple foundation: Jesus died, Jesus was buried, Jesus rose from the grave, and Jesus appeared to his disciples who were never the same after witnessing their resurrected Savior. Let's not let anyone distract us from these core truths or crowd out their simplicity with other matters they may claim to be essential. Our salvation is rooted in our faith and our participation in this simple, yet powerful Gospel. Dear God, I confess my faith in your work for me in Jesus. I believe that your Son and my Savior, Jesus, was crucified by wicked men just as you had said long ago in your Word. I believe his dead and lifeless body was placed in the tomb. I believe that on the third day, you brought him back to life, just as you promised. I believe that those most destroyed by his death, those who knew him best, saw him alive again. I believe their lives were never the same. I believe, dear Father, that as I have confessed my faith in Jesus and shared with him in his death, burial, and resurrection through baptism, that my life is caught up with him in your salvation and victory over death. I praise you for this grace. I thank you for this assurance. I look forward to sharing in your glory when he returns for me. Thank you for my salvation, in Jesus' name. Amen.